When the chemistry is right, big things can happen. 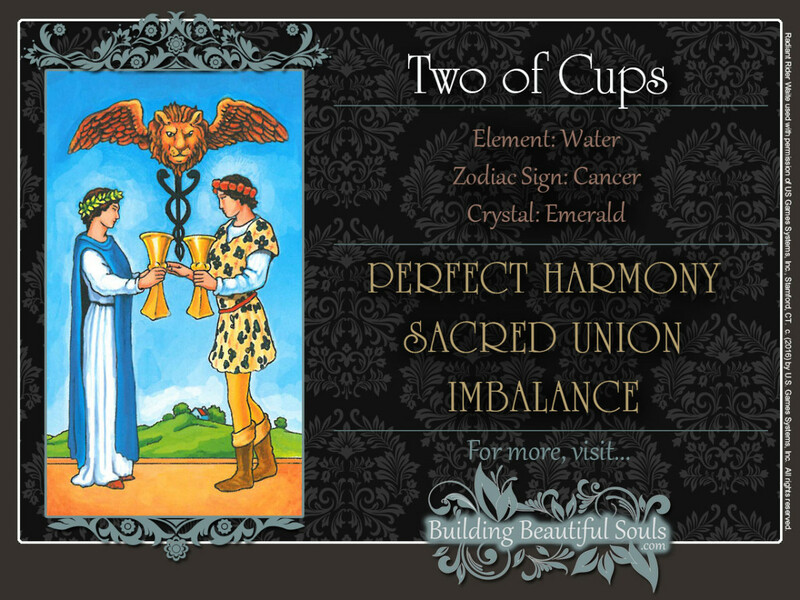 The Two of Cups shows how this principle applies to human interactions. In a reading, the Two of Cups is most often a card promising true love. After all, we are looking at two young lovers exchanging their vows. But the the Two of Cups’ symbolism encompasses so much more than romantic love. What we see here can also spell the beginning of a lifelong friendship, a “meeting of the minds” – or any situation in which human energies enrich and transform one another. Like in The Lovers of the Major Arcana, these things aren’t necessarily exclusive. Think of Pierre and Marie Curie, for example. In addition to being loving and devoted spouses, they were also brilliant physicists. More than a hundred years after their deaths, the world is still benefiting from their discoveries. Here in the Two of Cups, two complimentary energies combine forces to create a whole. The woman is crowned with laurel, symbolizing eloquence and victory, and the man with the red roses of love and passion. Her white and blue garments show her devotion and spirituality, the man’s yellow tunic, understanding. They contribute their own particular gifts to this union within the Two of Cups tarot card. Like the snakes on the Caduceus rising from between their cups, their combined energies create a vibration, a pulse that becomes stronger with each cycle. Soaring toward the sky like fireworks, the man and woman in the Two of Cups explode into a dazzling light show above their heads, the red, winged lion. The winged lion is actually an alchemical symbol. It represents the quality that makes a substance volatile – in other words, it’s whatever makes dynamite go “Boom!” It also symbolizes a substance’s higher (i.e. spiritual) essence. This is the kind of partnership, romantic or otherwise, in which both parties unlock and boost one another’s potential. Together, are accomplishing more than they could have ever hoped to do on their own. Exciting things are about to happen. Get a Tarot deck from our store that’s perfect for you! A chance encounter has the potential to turn into a lasting partnership. The Kabbalistic name of the Two of Cups card is Lord of Love, so if you have been looking for Mr. or Mrs. Right, the wait is almost over. If you already are in a relationship, it is ready to enter the next level – whatever that means to you. Venus in Cancer strengthens the bonds that are already existing between you and your partner. For example, after a few dates you may have decided that it’s now time for a committed relationship. Perhaps there are even wedding bells in your future. Remember that love is not always physical or romantic. It can express itself in many different forms, such as a strong friendship, a professional partnership, or dedication to a cause. What matters is how what’s happening makes you feel inside. Your interactions with others are energizing you. They’re filling you with a sense of purpose, opening your awareness to higher levels of consciousness. As the cozy house nestled in the rolling green hills shows in the background of the Two of Cups, this allows you to feel at harmony with the rest of the world. A closer look at the Two of Cups tarot card also shows that what you see here is actually happening in a very controlled environment – a theater stage, to be exact. In other words, you are not only dealing with physical events, but psychological processes. Some of these are conscious, but some are not. If you can learn to understand them, you can influence how your interpersonal relationships run their course. Your knowledge will allow you to understand how others feel. You will also be able to change how others feel about you. This is why the Two of Cups is also seen as a card of reconciliation, or at least forgiveness. When the Two of Cups card is reversed, it’s a sign to pay close attention to where your relationships with others are leading you. This may or may not be a romantic relationship. Here, you could also have questions about a friendship – or even a professional relationship. Ask yourself who’s in charge in this dynamic. Good relationships are based on mutual respect. But most of the time, one of the partners is the leader and the other follows. Trading places from time to time works well as long as there is a clear understanding about everyone’s role. Have you sorted that out? Relationships are about giving and taking. It’s important to understand that expecting your partner to give 50% all the time is unrealistic. Sometimes that ratio can be as imbalanced as 70/30 and that is usually a temporary situation – but not all the time. Keep in mind however, that fair and equal are not the same thing. For example, your different professional skills may not make it possible for each of you to contribute to the household budget equally. Or your work schedules may limit the amount of time you can spend with each other. Yes, these things can put a strain on any relationship. But what’s more important is how committed the two of you are to making things work. The Two of Cups reversed suggests that one of you is not willing to make the necessary allowances for the other’s limitations. On the other hand, it’s not necessarily your attitude that needs fixing. It’s also quite possible that you are being taken advantage of. Your gut instincts will give you key insights about what’s really going on. Don’t forget that the energies expressed in the Two of Cups card are created by the two of you. When the Two of Cups is reversed, you need to look at how you influence one another’s decisions. For example, are you helping one other overcome life’s challenges or are you creating more drama? The Two of Cups card doesn’t necessarily mean that a relationship is about to end. But it does encourage you to look at its dynamic, so you can take the best course of action. Kabbalistically, the Number 2are associated with the male aspect of deity and the sphere of the zodiac. In traditional numerology, 2 corresponds to the moon. In the Suit of Cups, this number stresses the importance of balance when working with powerful subconscious currents.